HARTFORD, CT (KTRK) -- Police officers and concerned citizens came to the aid of a fawn stranded on the side of the road on Saturday. In a Facebook post, the Hartford Police Department shared details of a sad story with a heartwarming ending. After finding a fawn whose mother was struck and killed by a driver, a motorist alerted authorities, who dispatched officers to the scene to recover the traumatized creature. 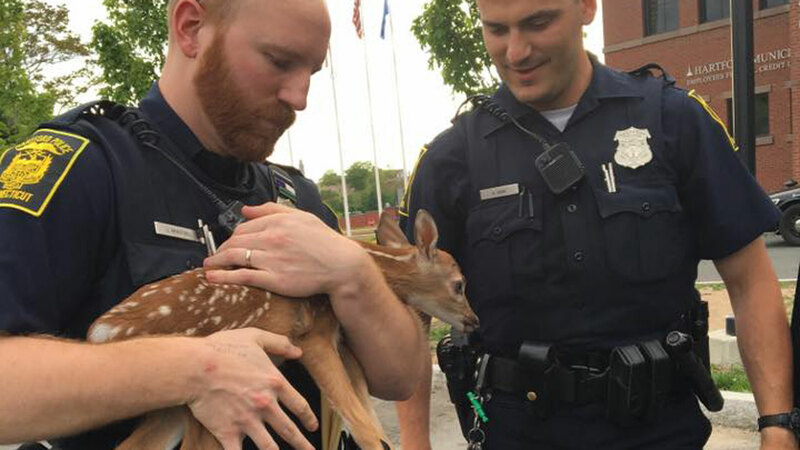 While waiting for the Connecticut Department of Energy & Environmental Protection to respond, Hartford police cared for the orphaned animal, sharing photos on social media of officers holding and cuddling the fawn. State officials eventually arrived and relocated the animal to a sanctuary.